If you love spicy food, hot and fiery chili oil deserves a place in your kitchen. Correctly prepared chili oil can spice up any recipe with just a few drops. Habanero chili oil can be kept for up to two months in an airtight container. To get the best results, use rapeseed oil though quality olive oil can also be used for the same. I've also added few regular chilies in this oil which gives it a distinct flavor complementing habanero extracts very well. I prefer to keep some of the chilies in the oil instead of removing them completely. If you want to add more kick in this oil, add smoked hot paprika in moderate quantity. So, let's get started and quickly make this flavorful and hot Habanero chili oil. Try this easy-to-make Habanero chili oil preparation which is not only spicy and pungent but also adds flavor to the recipes when used in small quantities. Heat rapeseed oil in a large heavy-base skillet on a very low flame for about 10 minutes. Make small cuts in the chilies and add in the oil with a pinch of salt. Continue heating on a low flame for 10 minutes before switching off the flame. Once gently give it a stir with a wooden spatula and cover the skillet with a lid keeping it aside for at least an hour. 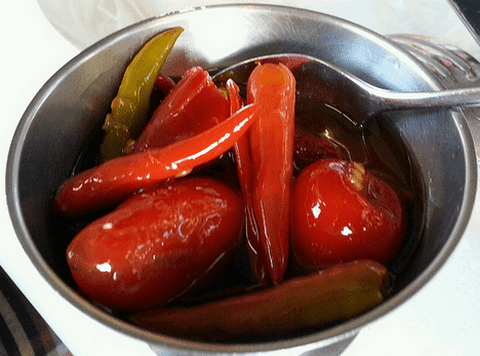 Leave some of the chilies in the oil and transfer it in a jar. Make sure the jar lid is airtight. Store at room temperature in your kitchen.